The new measures are expected to have the same effect and pull sales down by 15-20%. This chart from Colliers International shows how the last two rounds of cooling measures announced in January 2013 and June 2013 saw new home sales fall 65% to 712 units in February 2013 and 73% to 482 units in July 2013 respectively. The firm said the fresh measures – the ninth round of property cooling initiatives since 2009 - will put a drag on home sales this year as the higher ABSD could curtail investment demand from both locals and foreigners, and the larger cash outlay required for down payment on homes weighs on buying interest. 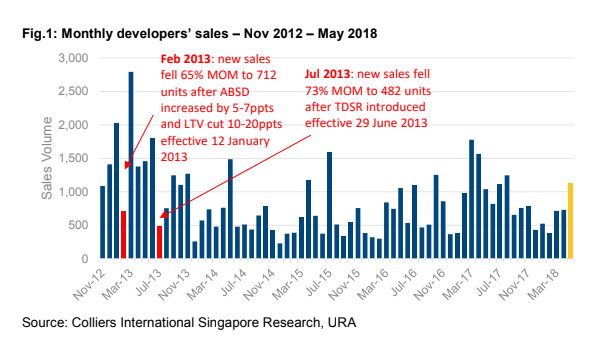 "That said, the flurry of last minute deals done – estimated at 1,000 units from three project launches – The Stirling Residences, Park Colonial and Riverfront Residences - on the evening of July 05 to beat the ABSD deadline indicated that there is both liquidity and pent-up demand for units in the market," Colliers said. "We expect new home sales to decline significantly in the initial few months as the market takes stock of the potential implications," it added. 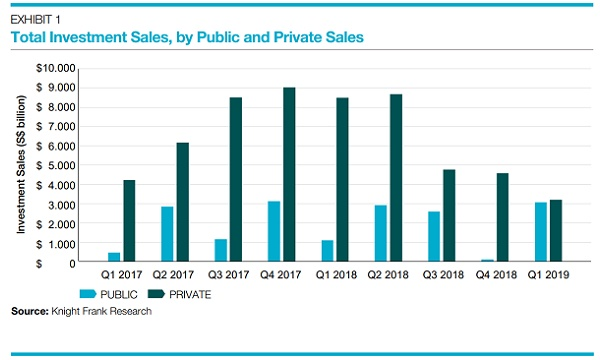 For the whole of 2018, Colliers projects that new private home sales (excluding executive condominiums) could come in at 8,500-9,000 units – 15-20% lower than the 10,566 units shifted in 2017. "We expect developers to delay launches as they re-strategise after the new measures were implemented. From January to May 2018, developers have sold 3,434 new units based on caveats lodged," it said.